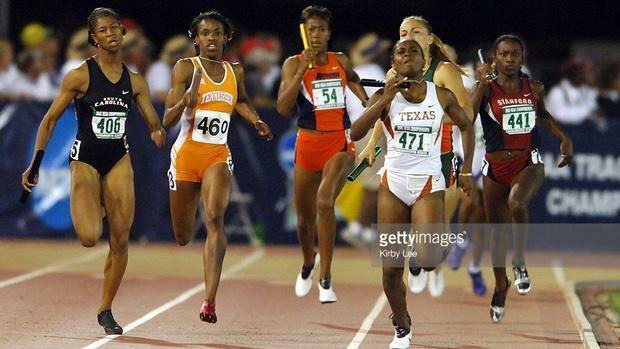 Two senior superstars from opposite ends of the country at the top of the national 400m rankings met in a quarter-mile showdown at the 2003 Golden South Invitational: Stephanie Smith of Northeast Macon Magnet School in Georgia and Shana Cox of Holy Trinity in New York. Georgia state champion Smith clocked the fastest time in prelims, 55.27, to Cox's 55.96, as Lauren Austin of Oviedo High also ran under 56 seconds and three more competitors broke 57 seconds. But the finals were a different story as Smith and Cox blasted by the rest of the field to set nation-leading marks of 52.14 and 52.43. Smith's winning time still stands as the Golden South meet record. Both closed the year with top accolades: Smith, the USATF Junior Outdoor National champion with a U.S. No. 1 time of 52.04, and Cox, the adidas Outdoor National champion with the U.S. No. 4-ranked time of 52.94. Smith became a star at South Carolina and picked up eight All-American honors for the Gamecocks, including a gold medal in the 4x400m relay. Cox, whose parents are of British descent, earned 11 All-American honors for Penn State, including the 2008 NCAA titles in the 400m and 4x400m relay. She ran a leg on the gold medal-winning 4x400m relay for Great Britain at the 2012 IAAF World Indoor Championships.